The standard Petri dish comprising of flat electrodes is deemed to be insufficient to study the working of brain cells and also to assess the impact of medication on separate cells. 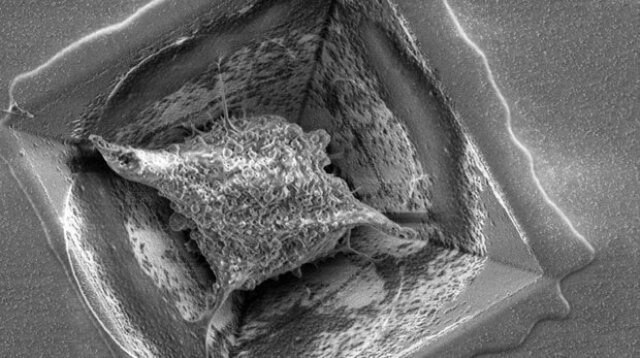 Cells are expected to increase within three-dimensional surroundings as far as realistic studies are concerned. Bart Schurink, researcher at University of Twente’s MESA+ Institute for Nanotechnology, has invented a sieve containing 900 openings, where each opening is shaped like an inverted pyramid. A micro-reactor placed on top of these pyramids is responsible for cell growth. Schurink defended his PhD thesis on June 23, 2016. A brain-on-a-chip requires more than a series of electrodes in 2D, on which culture of brain cells can be performed. The brain can be imitated in a realistic manner with facilities for fluid flow, and the cells require some amount of freedom for themselves even when they are placed at redefined spaces. Hence, Schurink created a micro sieve structure containing more than hundreds of openings on a surface measuring 2 by 2 mm. Each of the inverted pyramid shaped holes comprise of an electrode in order to send stimuli to the network or determine electrical signals. Liquids also flow simultaneously through the extremely small holes, required for capturing the cells and sending medication or nutrients to a single cell. Neurons begin to develop a network after they are placed inside all the pyramids. This is not only a 2D network existing between the holes: locating a micro reactor on top of the sieve leads to the development of a neuron network even in the vertical direction. It is also possible to control the electrical activity and growth, and the pyramid will also be able to detect every single cell present in it. The manufacture of this system requires increased creative solutions provided by the designers and production facilities at UT’s NanoLab. For instance, identifying an ideal way to guarantee the same dimensions for every single hole is indeed a challenging task. Schurink’s recently developed micro sieve electrode array (µSEA) has been examined with living cells, obtained from the brains of rats used for laboratory studies. The neuronal network growth and the arrangement of the cells have been examined. The findings of this PhD research is a completely new area to explore in order to perform research on the brain, effects of medication, and diseases. Schurink (1982) carried out his research within the group Meso Scale Chemical Systems, of Prof Han Gardeniers. The group is part of the MESA+ Institute for Nanotechnology of the University of Twente. Schurink’s thesis is titled ‘Microfabrication and microfluidics for 3D brain-on-chip’, and his defence was on June 23 at the University of Twente.